Born: 10 February, 1932, in Oldham, Lancashire. Died: 23 January, 2015, in Florida, aged 82. Barrie Ingham was an actor of considerable range who was acknowledged in both the classical and musical theatre. In the former, he played leading roles at the Royal Shakespeare Company and the National Theatre; he also appeared in London’s west end and on Broadway in several hit musicals. For good measure, he also found fame as a voiceover artist – voicing the sleuth rodent Basil in Disney’s animated mystery movie The Great Mouse Detective opposite the villainous Vincent Price. Ingham was seen at many of Scotland’s leading theatres – notably the Glasgow Citizens. In 1976, he was in Mikhail Lermontov’s epic Maskerade which brought to the stage a world of fops and gamblers while the music of Rachmaninov played throughout. The play was directed by Robert David MacDonald and also starred Paola Dionisotti . Ingham also visited Glasgow with a touring RSC production of Julius Caesar playing Marcus Brutus. Ingham came to two Edinburgh Festivals: the first at the beginning of his career, joining the Old Vic Company on a prestigious visit in 1958. He played O’Kelly in Schiller’s Mary Stuart with Irene Worth in the title role. In 1970, he joined a quartet of RSC actors in a delightful early evening recital of Shakespeare. The show was devised by the director Terry Hands and the cast also included Janet Suzman. Barrie Stanton Ingham attended the Heath Grammar School and did his national service with the Royal Artillery. He had been a keen member of the local amateur dramatic society and decided to continue in the profession, making his debut at the Library Theatre, Manchester, as a 24-year-old. In 1957, Ingham joined the Old Vic Company in London, where he gained valuable experience as Fortinbras to John Neville’s Hamlet directed by John Dexter. He also appeared in Henry VI Part 3 and Moliere’s Tartuffe. Ingham’s reputation had become established at the Old Vic and John Gielgud cast him as Claudio in Much Ado About Nothing for the company’s visit to Broadway in 1959. The cast also included Gielgud and Margaret Leighton. In the 1960s, Ingham consolidated his position, appearing in a variety of prestigious productions, including a new play, Strip the Willow, by Beverley Cross with Maggie Smith; John Arden’s The Happy Haven at the Royal Court; alongside Harry Secombe in the hit musical Pickwick, and with Angela Lansbury in Gypsy. 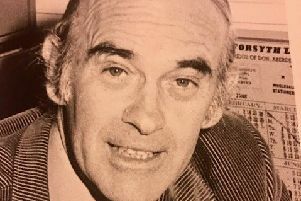 From 1967, Ingham returned to the RSC where he was involved in some historic productions: most notably in the joyous bucolic romp, Dion Boucicault’s London Assurance. Ingham played an hilarious Dazzle alongside Donald Sinden and Judi Dench in one the RSC’s greatest hits. But the classics were not ignored and, again with Sinden and Dench, he was seen in Twelfth Night. As Sir Andrew Aguecheek, Ingham was acclaimed for his subtle portrayal of the foppish character delivered with a wonderfully accurate Morningside accent. Other roles included Brutus in Julius Caesar and Lord Foppington in The Relapse. He was in David Hare’s The Bay of Naples at the National Theatre (with Worth). At this time he toured his solo show (Love, Love, Love) abroad and was on Broadway in, firstly, a long run of a revival of Camelot and a musical version of Jekyll and Hyde in 1997. Other major appearances in America included Me and My Girl and Lloyd Webber’s Aspects of Love. His last appearance in London (2005) was in fast-moving comedy Glorious! based on the colourful life of the eccentric diva Florence Foster Jennings. Directed by Alan Strachan, Ingham was a delightfully earthy old roué to Maureen Lipmann’s off-key soprano.. In the 1960s Ingham had been involved in two major television dramas. Firstly in Granada’s The Caesars which did not quite repeat the success of the BBC’s I, Claudius. But ATV’s The Power Game was a resounding success, charting skulduggery in the boardroom. Ingham was in the final, dramatic 13 episodes as an unscrupulous and devious arms dealer. He also made a strong impression in Star Trek: The Next Generation in 1989. There is a marvellous scene where Ingham and Patrick Stewart heartily sing Phil the Fluter. Ingham settled in Palm Springs where he lectured on Shakespeare. He is survived by his wife, Tarne, whom he married in 1957, and their four daughters.